عابدی, پروین, جرفی, مریم, افشاری, پوراندخت. (1396). بررسی سبک زندگی ارتقا دهنده سلامت و عوامل مرتبط با آن در زنان سنین باروری شهر اهواز. سلامت جامعه, 9(1), 68-74. پروین عابدی; مریم جرفی; پوراندخت افشاری. "بررسی سبک زندگی ارتقا دهنده سلامت و عوامل مرتبط با آن در زنان سنین باروری شهر اهواز". سلامت جامعه, 9, 1, 1396, 68-74. عابدی, پروین, جرفی, مریم, افشاری, پوراندخت. (1396). 'بررسی سبک زندگی ارتقا دهنده سلامت و عوامل مرتبط با آن در زنان سنین باروری شهر اهواز', سلامت جامعه, 9(1), pp. 68-74. عابدی, پروین, جرفی, مریم, افشاری, پوراندخت. بررسی سبک زندگی ارتقا دهنده سلامت و عوامل مرتبط با آن در زنان سنین باروری شهر اهواز. سلامت جامعه, 1396; 9(1): 68-74. مقدمه: با توجه به تأثیر سلامت زنان بر سلامت خانواده و جامعه این مطالعه با هدف بررسی سبک زندگی ارتقا دهنده سلامت و عوامل مرتبط با آن در زنان سنین باروری شهر اهواز انجام گرفت. مواد و روش­ ها: این مطالعه مقطعی بر روی 1200 نفر از زنان سنین باروری مراجعه­ کننده به 10 مرکز بهداشتی شهر اهواز که به صورت چند مرحله ­ای انتخاب شده بودند، انجام شد. ابزار گردآوری داده­ها پرسشنامه دموگرافیک و سبک زندگی ارتقا دهنده سلامت (HPLP2) بود. برای تجزیه و تحلیل داده­ ها از نرم افزار SPSS نسخه 21 و آمار توصیفی و نسبت شانس استفاده گردید. یافته ­ها: میانگین سنی شرکت­ کنندگان 14/6 ± 76/30 سال بود. بیشترین میانگین ابعاد سبک زندگی ارتقا دهنده سلامت مربوط به ابعاد مسئولیت ­پذیری در سلامت 81/7±11/35 و خودشکوفایی 26/6±94/31 و کمترین میانگین مربوط به بعد ورزش 34/5±89/11بوده است. نتایج نسبت شانس حاصل از رگرسیون لجستیک نشان داد که تعداد فرزند، تحصیلات و شغل زن و تحصیلات و شغل همسر از عوامل مؤثر بر سبک زندگی ارتقا دهنده سلامت بوده است (05/0 (p .
ارایه­ دهندگان خدمات سلامت به زنان با آگاهی از این نکات می­توانند گام­ های مفیدی در جهت ارتقا سلامت زنان بردارند. Ahvaz Jundishapur University of Medical Sciences Faculty of Reproductive Health Research Center of Nursing & Midwifery, Ahvaz, Iran. Introduction: According to the impact of women's health on family and community health, this study was designed to investigate the health-promoting lifestyle and its related factors in reproductive aged women in Ahvaz. Material and Methods: This cross-sectional study was conducted on 1200 reproductive aged women who were referred to 10 health centers in Ahwaz. They were selected by multistage sampling. Data collection were done by means of demographic and health promoting lifestyle (HPLP2) questionnaires. Data analysis were performed by SPSS 21 using descriptive statistics and odds ratios. Results: The Mean±SD age of participants was (30.76±6.14) years. The highest score of health promoting lifestyles were related to health responsibility (35.11±7.81) and self-actualization (31.94±6.26) and the lowest score was related to exercise (11.89 ± 5.34). Results of Odds ratios from logistic regression showed that, the number of children, occupational situation and educational level of wife, also occupational situation of her spouse were factors affecting health-promoting lifestyle (p 0.05). Conclusion: By reason of the impact of some demographic characteristics on the health promoting lifestyles, health planners and health service providers to women, attentiveness to these points are enable to take the best decisions for women's health promotion. Pirincci E, Rahman S, Durmuş A, Erdem R. Factors affecting health-promoting behaviours in academic staff. Public health 2008;122(11):1261-3. Organization WH. The WHO cross-national study of health behavior in school-aged children from 35 countries: findings from 2001-2002. Journal of School Health 2004;74(6):204-6. 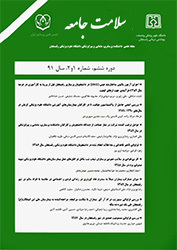 Tol A, Tavassoli E, Shariferad GR, Shojaeezadeh D. Health-promoting lifestyle and quality of life among undergraduate students at school of health, Isfahan University of Medical Sciences. Journal of education and health promotion 2013;2:11. Bahar Z, Beşer A, Özbıçakçı Ş, Haney MÖ. Health promotion behaviors of Turkish women. Dokuz Eylül Üniversitesi Hemşirelik Fakültesi Elektronik Dergisi. 2014;6(1):9-16. Ammouri A. Demographic differences in health promoting lifestyle of adult Jordanians 2008;42(4):1-9. Mirghafourvand M, Baheiraei A, Nedjat S, Mohammadi E, Charandabi SM-A, Majdzadeh R. A population-based study of health-promoting behaviors and their predictors in Iranian women of reproductive age. Health promotion international 2014:dat086:1-9. Walker SN, Sechrist KR, Pender NJ. The health-promoting lifestyle profile: development and psychometric characteristics. Nursing research 1987;36(2):76-81. Lee F-H, Wang H-H. A preliminary study of a health-promoting lifestyle among Southeast Asian women in Taiwan. The Kaohsiung journal of medical sciences 2005;21(3):114-20. Enjezab B, Farajzadegan Z, Taleghani F, Aflatoonian A, Morowatisharifabad MA. Health promoting behaviors in a population-based sample of middle-aged women and its relevant factors in Yazd, Iran. International journal of preventive medicine 2012;3(Suppl1):S191-8. Ballard FA. Homeless sheltered women's health promotion behaviors [ PHD Philosophy thesis ]. Greensboro: University of North Carolina; 2009: 115. Beser A, Bahar Z, BUYUKKAYA D. Health promoting behaviors and factors related to lifestyle among Turkish workers and occupational health nurses' responsibilities in their health promoting activities. Industrial health 2007;45(1):151-9. Al‐Kandari F, Vidal VL. Correlation of the health‐promoting lifestyle, enrollment level, and academic performance of College of Nursing students in Kuwait. Nursing & health sciences 2007;9(2):112-9. Chen M-Y, James K, Wang EK. Comparison of health-promoting behavior between Taiwanese and American adolescents: a cross-sectional questionnaire survey. International journal of nursing studies 2007;44(1):59-69.